This cell is a combination of magnesium, aluminium and stainless steel. The cell weighs .061 lbs. and has a lifetime shelf life. It’s dimensions are 3″ X 12″ X 1/4″. This cell when immersed in seawater releases hydrogen gas. The by-product from this chemical reaction is heat and magnesium hydroxide http://www.allh2.com/811061.html . The magnesium hydroxide is recycled and the heat is used for heating your water at home. He says the space between the 14 Stainless Steel 316L plates is 0.6mm only, and the cell uses 100Amp at full power (100 A x 12 V = 1,200 Watts / 748W/H.P. = 1.6 Horse-Power at maximum); so it should need a lots of big transistors to pulse this current ! But the most particular in his design is that the cell is not immersed ; he sends the necessary water through it at the moment it is needed ; and this cell can use tap water as well as sea water. We still don’t have the answer as how he sends the water in the cell, or by High Pressure Injectors, or by the Vacuum of the Venturi created by the engine ; in the last case it would be very cheap to reproduce his system, even if it still need a proper electronic circuit that can pulse the current. The cell is installed in between the carb and the admission, the water going through the plates because of the Vacuum of the engine. We remember that Archie Blue was saying that the problem of the immersed electrolyzers was the sticking of the bubbles on the plates, reducing efficiency ; he was using air vacuumed through the bottom of his cells to collect the HHO bubbles on the way to the engine. Here we have the air and water that cross the very closed plates (what give high current intencity without electrolyte NaOH or KOH). And current pulsed a 30Khz is also something we can find in some patents. Zigouras seems to put his system before the carburetor’s butterfly, so I think he uses injection pump, but the one I’m going to build will be with vacuum, because much cheaper and simple. I’ll use a square hollow pipe, Stainless Steel 40mmx40mm, with plastic sheet on the inside sides to hold the plates and insulate electricaly, and many SS plates spaced at 0.5mm, fixed with screw and nylon washer. – If you want to run your car only on water (pipe/tap water not recommended) you will need to pulse at 30Khz and use 100Amps. – And if you want to run at higher RPM you will need and alternator that can produce 200 Amps. – He’s going to sell on E-BAy cars that use only water, ready to use, not needing petrol-fuel at all. – He guaranty that the set of plates will arrive tested for electric shorts, but compressing them to much could bring the silicon that join them to melt under the high current. – The plates are spaced at 0.025″ apart, but by compressing them you can reduce the space, but be carefull at the electric shorts risks. – The is best installed at less than 3 feet form the intake manifold, and on our cars we put it right in the air-filter box, or on the air-filter. – The square wave pulsed current is needed, and without it (like with a sinewave signal) the efficiency is so low (less 80%) that a car could not run on it alone ; He says that if you’re not able to make the electronic part for pulsing, it’s better not to buy the cell. – With the perfect square wave this cell can electrolyse 2 gallons of water per minute, that should be enough for most of the V8 engines. – There is not so much power in water, so you will consume a lot of it. – This technology doesn’t violate the patent rights of Xogen (USP # 6.126.794), and all the other precedent patent are already expired. ## POWERBALLS, Powerball Technologies Inc.
A company in Utah has come up with the idea of compressing sodium hydride powder into balls and then coating these ping-pong balls with plastic so that they can be easily and very safely transported.Now if you drop one of these balls in water, nothing will happen.But if you break one open your get tons of H2 gas at high pressure if in a sealed container. They have designed a pressure reactor that contains water and a bunch of powerballs floating around.Inside the reactor chamber is a device that captures and then slices a powerball thereby releasing the NaH into the water.The cutting device is controlled by a pressure switch on the gas feed line, thus when gas pressure drops it triggers another ball to be cut, pressure then goes back up.This gives you hydrogen-on-demand (HOD) and a pressurized buffer supply. Is this enough to run an internal combustion engine?Yes. But it would be more efficient to use this hydrogen gas in a fuel cell and run an electric car. In either case, this technology approach will create a closed loop economic recycling system whereby gas stations would now sell powerballs and dump into storage the sodium hydroxide (NaOH) and plastic casings to be completely recycled back into more powerballs. No waste.This creates a new economic industry that does NOT pollute the environment. Can the reactor explode?No. Since the powerballs are floating in water and only enough gas is produced at any one time to maintain an operating pressure level that is well under the operating strength of the pressure vessel, there is no chance for a pressure explosion.Any hydrogen gas leaks would also not explode, as this requires the hydrogen to mix with atmospheric oxygen in a 2:1 mix before it would become explosive.Any greater or lesser mix and the hydrogen just burns as a clear flame. Hydrogen is the main fuel source for power generation with fuel cells, but its storage and transportation are still major issues. To overcome these problems, hydrogen has been stored and transported via other chemical compounds, such as alcohols, hydrocarbons, ammonia, etc. In many ways, ammonia is an excellent hydrogen carrier ; liquid ammonia represents a convenient way of storing supplies of hydrogen, boasting a specific energy density (kWh/l) 50% higher than liquefied hydrogen. Ammonia is also easily condensed at ambient temperature (under 8 bar of pressure), which makes it a good choice for transportation and storage. Even though ammonia is flammable within defined limits (16%-25% by volume in the air) and toxic (above 25 ppm) its presence can be detected by its characteristic odor (above 5 ppm). Ammonia is produced world-wide in large quantities (more than 100 million ton/year), which allows the effect of economy of scale on the cost of production. Its decomposition by electro-oxidation in alkaline media at low overpotentials is NOx and COx free with nitrogen and water as products of reaction . Reactions (1) and (2) take place at the anode and cathode, respectively. At 25 oC the ammonia oxidation potential is -0.77 V versus Standard Hydrogen Electrode (SHE), only 0.06 V less negative than the value of -0.83 V vs. SHE for hydrogen evolution in alkaline solution. Therefore, thermodynamic values are much in favor of the production of hydrogen coupled to the oxidation of ammonia compared to hydrogen production by electrolysis of water, for which the theoretical cell voltage is 1.23 V. One of the advantage of this process is its ease of integration with renewable energy (electricity) sources. Because the energy consumption is low, the cell could operate with renewable energy (or by stealing part of the energy of a PEM hydrogen fuel cell if the ammonia electrolytic cell operates close to the theoretical potential). Therefore, hydrogen could be produced on demand, minimizing the needs for hydrogen storage. The theoretical energy consumption during ammonia electrolysis can be calculated from the standard potential of the cell and is equal to 1.55 Wh/g H2 while the electrolysis of water requires at least 33 Wh/g H2 at standard conditions, this means that theoretically the electrolysis of ammonia consumes 95% lower energy than a water electrolyzer. The scalability of the technology as well as its ability to easily operate in an on-demand mode facilitates the technology’s ability to interface with renewable energy sources including those whose production of electricity may vary with time (for example, wind and solar energy). Recently, we had developed novel catalysts that enhance the oxidation of ammonia in alkaline medium. The catalysts are made by electrodeposition of nobel metals on carbon fibers . The novel electrocatalysts allow the achievement of current densities of up to 75 mA/cm2 at cell voltage of 0.45 V. Within this context, the objective of this paper is to evaluate the technical and economical feasibility of producing hydrogen from the electrolysis of ammonia for distributed power generation using the novel electrodes. These results will be presented at the meeting. – 1. R. A. Wynveen, Fuel Cells 2, (1963) 153. – 2. S. Wasmus, E. J. Vasini, M. Krausa, H. T. Mishima and W. Vielstich, Electrochimica Acta 39, (1994) 23. – 3. F. Vitse, M. Cooper and G. G. Botte, J. Power Sources 142, (2005) 18. – 4. G. G. Botte, F. Vitse and M. Cooper, “Electrocatalysts for the Oxidation of Ammonia and their Application to Hydrogen Production, Fuel Cells, Sensonrs, and Purification Processes”, Pending Patent, (2003) US. – 5. G. G. Botte, “Carbon fiber-electrocatalysts for the Oxidation of Ammonia, Ethanol, and Coal, and their Application to Hydrogen Production, Fuel Cells, and Purification Processes”, Pending Patent, (2004) US. A new method for the sustained production of hydrogen has been discovered by researchers in ORNL’s Chemical Technology Division (CTD). The discovery could lead to the development of palm-sized fuel cells that cost only a few cents a piece. The fuel cells could be used to power compact environmental sensors for the U.S. military, as well as cell phones, cameras, and portable audio and video equipment. Soldiers could easily carry these fuel cells on the battlefield and recharge them by adding iron powder and vinegar and then shaking them. These cells could serve as micropower sources for sensors that can detect the presence of hazardous gases and emissions from nearby chemical and biological warfare weapons. In the summer of 1998, CTD’s Jonathan Woodward and researchers John Getty and Mark Orr tried a new way to make hydrogen from sugar, which involved the deposition of the metal platinum on a glucose-digesting enzyme. The experiment worked. Gluconic acid is an organic acid consisting of carbon, hydrogen, and oxygen (C6H11O7) that is produced from glucose sugar, an abundant and renewable carbon source. Woodward noted that the sustained hydrogen-production reaction works well under three conditions: a temperature of 80°C, neutral pH, and the absence of oxygen. Although the mechanism of the reaction is not fully understood, Woodward says that iron may be serving as the active catalyst for the production of hydrogen gas from water under anaerobic conditions. During the reaction, the metal iron (Fe) is converted to an iron-oxide compound called magnetite (Fe3O4). The magnetite would then be reduced back to iron in the oxygen-free atmosphere containing gluconic acid. Thus, the iron catalyst would be regenerated from the magnetite, enabling the continuing production of hydrogen. “We found that after 100 hours of the experiment, we lost little metal and got more hydrogen than we expected,” Woodward says. “We generated more hydrogen than the typical metal displacement reaction where iron is normally consumed. We believe that some of the hydrogen is produced by the reaction of the iron metal with the organic acid, but more experiments must be done to prove that. Purdue researchers have developed a novel technique for producing hydrogen from water. It requires only water, a catalyst based on the metal rhenium (REE-nee-um) and an organic liquid called an organosilane, which can be stored and transported easily. Though the method has not yet been evaluated for economic feasibility on a large scale, chemist Mahdi Abu-Omar said it could offer solutions to several problems facing developers of fuel cells, which are looked upon as a potential replacement to fossil-fuel burning engines in automobiles. Abu-Omar’s research team, which includes Purdue’s Elon A. Ison and Rex A. Corbin, published their findings today (Wednesday, Aug. 31) in the Journal of the American Chemical Society. Abu-Omar’s team took a compound based on rhenium, a comparatively rare metal often obtained while mining copper, and added it to the organosilane in the presence of water. Over the course of an hour, the organosilane changed completely into silanol, leaving the water and rhenium catalyst unchanged. But the team also noticed there was a gas bubbling from the mixture. The team estimates that about 7 gallons each of water and organosilane could combine to produce 6 1/2 pounds of hydrogen, which could power a car for approximately 240 miles. Penn State researchers have demonstrated that hydrogen can be recovered from wastewater.An article on the Renewable Energy AccessWebsite tells about the process which can produce four times the hydrogen than can be produced directly by fermentation.They use the same microbial fuel cell (MFC) that they have developed to clean wastewater and produce electricity.To produce hydrogen they keep the oxygen out of the MFC and add a small amount of power to the system.They call their hydrogen producing MFC a BioElectricrochemically Assisted Microbial Reactor or BEMAR. Only a tiny amount of electricity, about 0.25 volts is applied across an annode and a cathode inserted in the BEMAR.In a university press releasethe process is described in more detail.When bacterial eat the biomass contained in wastewater, they transfer electrons to the anode.The bacteria also release protons which go into the solution.The electrons migrate via a wire to the cathode where they are eltrochemically assisted to combine with the protons to form hydrogen gas. A paper titled “Electrochemical Assisted Microbial Production of Hydrogen from Acetate http://pubs.acs.org/cgi-bin/abstract.cgi/esthag/asap/abs/es050244p.html ” fully describes the approach.The paper was authored by Hong Liu, a post graduate researcher; Stephen Grot, president and founder of Ion Power, Inc.; and Dr Bruce Logan, professor of environmental engineering and inventor of the MFC.Grot is a former Penn State student who suggested the idea of modifying the MFC to generate hydrogen. Links at Logan’s website http://www.engr.psu.edu/ce/ENVE/logan.htm reveal the following: The process releases about 50% of the hydrogen locked up in the biomass.At this efficiency, if all the domestic wasetewater was treated by this process, about 4000 MW of electricity could be produced.While this process will not sustain a hydrogen economy, it could offset the substantial costs of wastewater treatment. In a feasibility study funded by the UKs Engineering and Physical Sciences Research Council (EPSRC), bioscientists at the University of Birmingham have demonstrated that certain bacteria can produce hydrogen gas as they consume high-sugar waste produced by the confectionery industry. The sweet waste was supplied by Birmingham-based international confectionery and beverage company Cadbury Schweppes plc, a partner in the initiative. An economic assessment undertaken by another partner, C-Tech Innovation Ltd, showed that it should be practical to repeat the process on a larger scale. 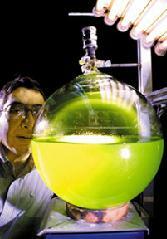 Eli Greenbaum studies algae being used to produce hydrogen from water in an illuminated flask. Hydrogen is commonly stripped from natural gas, but that process leaves carbon dioxide, which must be disposed of in an environmentally acceptable way. The conventional way to produce hydrogen without generating carbon dioxide is to separate hydrogen from oxygen in water using electrolysis. These algae normally grow new cells by photosynthesis, using carbon dioxide from the air in the presence of sunlight. But after placing the aquatic organisms in a large flask of water illuminated by lamps, the ORNL researchers “trick” the algae by depriving them of carbon dioxide and oxygen. As a result, a normally dormant gene becomes activated, leading to the synthesis of the enzyme hydrogenase. Membrane separation technologies are being developed that will separate the hydrogen from the oxygen more efficiently. Because the algal hydrogenase eventually shuts down from exposure to oxygen, Michael Seibert and Maria Ghirardi, researchers at the National Renewable Energy Laboratory, are working to create a mutant organism that makes a hydrogen-producing enzyme that is less sensitive to oxygen. The third challenge is to optimize the ability of the algae to use light. Jonathan Woodward and his associates in CTD are trying to use enzymes to make hydrogen from the cellulose present in old newspapers, grass clippings, and other waste products of renewable resources. The first step is to transform cellulose into glucose sugar, and the second step is to convert the glucose product and its byproduct, gluconic acid, into hydrogen. The second step has proved easier. In 1996 Woodward and his colleagues reported an important advance. They learned how to produce a molecule of hydrogen from a molecule of glucose using two enzymes (called extremozymes) produced by microorganisms that grow under extreme temperatures. In October 1999, CTD researchers Woodward, Mark Orr, Kimberley Cordray, and Greenbaum reported producing 11.6 hydrogen molecules for every glucose molecule in the substrate. The researchers achieved 97% of the maximum stoichiometric yield possible-12 hydrogen molecules for each glucose molecule. This is the highest yield of hydrogen ever obtained from glucose by a biological process. The results are to be published in an upcoming issue of Nature. This high stoichiometric yield of hydrogen from glucose was attained through an “oxidative pentose phosphate cycle” using 11 enzymes. In this cycle, glucose is oxidized completely to the compound NADPH and carbon dioxide. In the presence of the extremozyme hydrogenase, hydrogen is released. This extremozyme produced by the bacterium Pyrococcus furiosus is also one of only two such enzymes known to accept electrons from NADPH to produce hydrogen. The Aqueous Phase Reforming (APR) process, invented by J. A. Dumesic and co-workers at the University of Wisconsin, is a unique process that can produces carbon-neutral hydrogen, fuel gas, liquid fuels or value added chemicals from a wide range of oxygenated compounds, such as ethylene glycol, biomass-derived glycerol, sugars and sugar-alcohols. Specifically, Virent, a company founded by Dumesic and others is developing a system to generate hydrogen from aqueous solutions of these compounds in a single step reactor process as compared to the three or more reaction steps required for hydrogen generation via conventional processes that utilize non-renewable fossil fuels. In January the company announced that in a system purchased by Madison, Gas & Electric (MGE), it has successfully started up a demonstration system capable of directly converting sugars and glycerin into power. The system (see schematic below) has demonstrated the ability to deliver a minimum of 10kW of clean power to the MGE grid since its startup at the beginning of 2006. The system is utilizing the waste heat from the ICE to provide the limited amount of process heat required for the reactor.The system currently operates on pure glycerin. In the future, the Company will use a lower grade of glycerin that is generated as a byproduct of the biodiesel production process. The process (US. Patent No. 6,699,457) will enable localized production of hydrogen using readily available sugar-based feedstocks effectively eliminating hydrogen transport, storage and safety roadblocks that impede adoption of hydrogen fueled power systems. Due to the low temperature operation of APR, the economics are scalable to small home and office use applications. Depending on the feedstock, the process is capable of producing green hydrogen at a total cost of between $1.80-$4.00/kg. This is dramatically less than alternative renewable sources, such as wind and solar, and very competitive with mature, capital intensive hydrogen production methods such as natural gas reformation, coal gasification or electrolysis. In 2010 your mobile phone may be powered by water. Samsung Electro-Mechanics announced Thursday that it has developed a micro-fuel cell and hydrogen generator that runs on H20. Samsung Electro-Mechanics unveiled the new technology at the 2007 Korea Electronics Show at the Korea International Exhibition Center in Ilsan, Gyeonggi Province. ## 1974, Eric COTTEL, UK, Originally printed in “Newsweek”, June 17, 1974. Cottell reasoned that if water could largely replace air as a source of oxygen incombustion,thiswouldavoid the largeamounts of nitrogen introduced bytheair and thus eliminate much of the noxious nitrogen oxides. “To accomplish this, he turned toa device he had patented 22 years ago an ultrasonic reactor that emulsifies heavyliquidsandis widely used todayto prepare such products as Worcestershire sauce, ketchup, cosmetics and paint. … (2) thatthesmall water dropletsexpandonheating,then explode into steam, in turn shattering theoilintofiner particles,andthusincreasing the surface area of the fuel exposed for burning. “Last month Cottell divided his timebetweenWashington,in talks with officials of the Federal Energy Office, and Detroit,wherehe consulted with engineersworking to meet the tight 1976 automobile emission requirements. So far, autotestshaveshown that withanultrasonicreactor attached to acarburetor,a car can get almost DOUBLEthenormal miles per gallon of gasoline with negligible exhausts. Cottell’s company, TymponicCorp.ofLongIsland,N.Y., is also about to produce units for home oilburners that will be no larger than a flashlight and cost $100 to $150. This filepointstoa possibly useful techniqueforthose working withwaterdissociationfor the purposeofhydrogen fueled motors.Thesmallertheparticle is, the less energy required to dissociate into consecutivelysmallerunits.This is probably one of the inspirational sources used by Stan Meyers for his “fractioning” process. Ultrasonic generators can be both mechanicalorelectronicin nature. Transducerscanbeeasilypurchasedwithresonant frequencies ranging from 20KHZto40KHZ. A revolutionary combustion system makes it possible to burn emulsions of fuel and water. It works in a car engine as well as an oil furnace  and cuts pollutants, too. Its impossible. An oil burner simply cant run on a fuel that is one-third water — tap water, at that. But I recently saw it done. The demonstration was at the Bayville, NY home of Eric C. Cottell, a British-born engineer and inventor. The gadget that made the “impossible” happen is a Cottell invention called the Ultrasonic Reactor — a device resembling a long, slim electric motor. It contains a crystal stack at one end and a mixing chamber at the other. When a 60-cycle current is applied, the crystals vibrate at 20,000 cycles per second, turning the reactor into a “super-blender”. 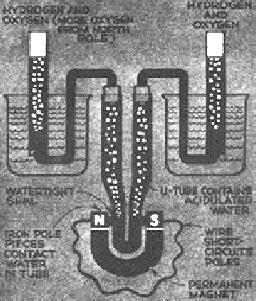 As shown in the diagram, oil and water (70% oil, 30% water) flow into the reactor, where a terrific vibrating force causes water and oil molecules to rupture. The two liquids form an emulsion in which tiny particles of water are dispersed throughout the oil. When this happens, says the inventor, the surface area of the water is increased millions of times. Thus, when the emulsion hits the furnaces combustion chamber, the water “explodes” into superheated steam, adding to the energy ouput of the oil. In hundreds of tests of his system, Cottell has found that ordinary boilers run at efficiencies close to 100% — as astounding result that neither he nor leading combustion experts can explain. In the demonstration I saw, gauges indicated that the emulsion produced the same amount of heat as a 100% oil fuel. In addition to stretching fuel, the system reportedly produces fewer pollutants than standard oil combustion. The fact that one-third less oil is burned is a key anti-pollution factor. # Cottell, Eric C ., US Patent # 3, 749,318, US Cl. 239/102 ~ July 31, 1973, Combustion Method and Apparatus Burning an Intimate Emulsion of Fuel and Water. A combustion apparatus and process in which a water-in-oil emulsion of liquid fuel, such as liquid hydrocarbons, containing from 10 to 50 % water, the emulsion being produced without any substantial emulsifying agent and preferably by sonic agitation, is burned. The combustion of liquid fuel, such as liquid hydrocarbons, is a standard method of power and/or heat generation. The combustion may be in a system where the heat is transferred to another medium, such as water, with or without boiling the water, or the fuel may be burned in various types of internal combustion engines, such as those operating on Otto, diesel, or other cycle. The amount of oxygen, usually air, is at least about theoretically sufficient for complete combustion of the fuel elements. Considerable problems have arisen. If there is a very large excess of oxygen, the efficiency of the combustion process is lowered because a considerable amount of the air, including inert nitrogen, has to be heated up. In the case of an internal combustion engine, operating with excessive amounts of oxygen can result in slow combustion, which can overheat and burn out exhaust valves. If the combustion is with amounts of oxygen and fuel more nearly in balance, for example with only a small excess of oxygen, problems arise with incomplete combustion. This can result in excessive amount of carbon monoxide and/or incompletely burned fuel, which may show up as unburned hydrocarbons, soot and the like. Incomplete combustion lowers the combustion efficiency and can also contaminate the equipment. In the case of internal combustion engines, unburned hydrocarbons, carbon monoxide, and oxides of nitrogen, generally symbolized by the formula NOx, are serious atmospheric pollutants as they give rise to photochemical smog and the like. Contamination of NOx from an IC engine usually results when combustion temperature is high. It has been proposed in the past to introduce streams of water into a burner or to inject water into an internal combustion engine as it operates. This has proven to reduce somewhat incompletely burned fuel deposited in the form of carbon, and in the case of IC engines this can lower NOx production and also in certain cases, such as aircraft piston engines, permit operating for short times at higher power outputs with very rich mixtures which would otherwise burn up the engine. Water injection, however, has serious drawbacks. In the first place, it is very difficult to control relative amounts of water and fuel precisely. Even if the control is maintained to a satisfactory degree, efficiency drops because the water has to be vaporized, with its extremely high latent heat, and heated up in the combustion, which takes further power because of the high specific heat of water vapor. As a result, water injection has only bee practically used in unusual circumstances. Figure 5 is a horizontal elevation detail of the expanded plate at the end of the probe. # Cottell, Eric C ., US Patent # 3,941,552, US Cl. 431/1 ~ March 2, 1976, Burning Water-in-Oil Emulsion Containing Pulverized Coal. Pulverized coal is slurried with water then oil or if desired oil and pulverized alkalis preferably lime or limestone is added and the mixture subjected to sonic vibrations with an energy density of at least 11.625 watts per cm.sup.2. Liquid suspension is produced and any excess water or oil separates out as a separate phase. Normally excess oil is used and the excess oil phase can be recycled. The resulting dispersion is utilized and burned in a furnace. A clean flame is produced which has the characteristics of an oil flame and not a powdered coal flame. The addition of lime is optional as its purpose is to reduce sulfur dioxide in burning where the coal contains sulfur. If there is no sulfur or so little as to meet environmental standards the addition of lime may be omitted. The amount of lime is preferably at least about twice stoichiometric based on the sulfur content of the coal. Up to 80% of sulfur dioxide produced on burning can react with the lime and the calcium sulfate produced removed by conventional particle separators. FIG. 3 is a diagrammatic flow sheet of a practical installation atomizing the coal dispersion to form a flame. FIG. 4 is a semi-diagrammatic illustration of an ultrasonic probe. # Cottell, Eric C ., US Patent # 4,048,963, US Cl. 123/25R – September 20, 1977, Combustion Method Comprising Burning an Intimate Emulsion of Fuel and Water. A combustion process in which a water-in-oil emulsion of liquid fuel, such as liquid hydrocarbons, containing from 10 to 50% water and preferably 10 to 30% water is burned. The emulsion is produced, with little or no added emulsifying agent, by sonic agitation, including a sonic generator and an acoustic transformer having a larger cross-section coupled to or in contact with the sonic generator than at its other end, at which emulsification takes place, whereby the sonic energy density is increased. With the increased sonic density an emulsion is produced which when burned produces a quality of burn such that the combustion is faster, more complete, and cleaner, with an increase in efficiency even up to 30% of water. The increase in efficiency often equals that obtained by the burning of the same weight of pure fuel in the conventional manner. 2704535 Mar., 1955 Magui 123/25. 2947886 Aug., 1960 McGunegll 239/102. 2949900 Aug., 1960 Bodine 239/102. 3070313 Dec., 1962 Fortman 239/102. 3145931 Aug., 1964 Cleall 431/1. 3200873 Aug., 1965 Young 239/102. 3374953 Mar., 1968 Bodine 239/102. 3606868 Sep., 1971 Voogd 123/25. 3658302 Apr., 1972 Dulhion 239/102. The following file was posted on the KeelyNet BBS as COTTELL.ASC on February 15, 1992. This file is shared with KeelyNet courtesy of Tom Brown, Director of Borderland Sciences. The Journal of Borderland Sciences http://www.borderlands.com/ has been in active publication since 1945. It is an excellent quarterly magazine with subscribers worldwide. If you might like to subscribe, please mention that you heard of Borderland from either Vanguard Sciences or KeelyNet. This file points to a possibly useful technique for those working with water dissociation for the purpose of hydrogen fueled motors. The smaller the particle is, the less energy required to dissociate into consecutively smaller units. This is probably one of the inspirational sources used by Stan Meyers for his “fractioning” process. Ultrasonic generators can be both mechanical or electronic in nature. Transducers can be easily purchased with resonant frequencies ranging from 20KHZ to 40KHZ. Of course, that is simply where they are most efficient, they will still transmit other frequencies just as any speaker will. One of the greatest dangers in relation to hydrogen from water is the need to store accumulated hydrogen in some container, thus allowing the possibility of a “Highway Hindenburg.” Any method of hybrid method that would create hydrogen at a sufficiently rapid rate, on demand, is far to be preferred. Can a magnet take water to pieces? No, say physics textbooks. Yes, says Prof. Felix Ehrenhaft, former director of the Physical Institute at the University of Vienna, who now carries on his research in New York. For his “impossible” experiment, Dr Ehrenhaft employs the simplest of apparatus. Two shiny rods of pure Swedish iron, sealed in holes through opposite sides of a U-shaped tube, resemble a setup familiar to high-school students for breaking up water into hydrogen and oxygen gases by passing electricity through it. And that is exactly what would happen if Dr Ehrenhaft attached electric wires from a battery to the rods. But, he does no such thing. Instead, he uses the iron rods as pole pieces, or North and South ends of a magnet — either an electromagnet or a permanent magnet. Bubbles of gas rise through the twin columns of acidulated water, to be collected and analyzed. As might be expected, nearly all of the gas is hydrogen, liberated by a commonplace chemical interaction between the iron rods and sulfuric acid, one percent by volume, in the water. But the phenomenal part of the experiment is that oxygen also turns up, Dr Ehrenhaft recently told the American Physical Society. To be specific, it is found in clearly measurable proportions ranging from 2 to 12% of the total volume of gases. When the gases obtained with a permanent magnet are separated, the larger proportion of oxygen is found above the north pole of the magnet. After rigorous precautions that seem to rule out all other explanations — including short-circuiting the magnet poles with wire, so that the poles will be at the same electric potential — Dr Ehrenhaft concludes that tere is only one place the oxygen can come from. And that is from the water decomposed with a magnet! Without a magnet, pure hydrogen is evolved. By observing whirligigs of electrically charges particles in a magnetic field, Brother Gabriel Kane of Manhattan College and Charles B. Reynolds of the Federal Communications Commission confirm the phenomenal discovery of magnetic currents by Dr. Felix Ehrenhaft (P.S.M., June 1944, p. 130). Going further, they make a drop of copper sulfate solution spin between the pole pieces of a permanent magnet, even rotating in interposed microscope cover glass with it. Present laboratory tests may lead to momentous applications in power machinery of the future. – Radio-Electronics (1978 ), “Lights That Failed”, Discovery of the Age? In March 1944, Radio-Craft published an article, “Magnetic Current — Discovery of the Age?”. It described the work of refugee scientist Felix Ehrenhaft, Director of the Physics Institute, University of Vienna. Ehrenhaft believed that he had discovered particles with a one-pole magnetic charge (either N or S but not both). Beaming light on the gap between the poles of a powerful electromagnet, on the lower pole piece of which powdered metal had been scattered, he found that when the magnet was activated he could see some of the particles spring from the lower to the upper pole. Ehrenhaft believed that this indicated that they had a monopolar magnetic charge (Others were not so sure).
. So the subject is still open. Theoretically, there is a place in the universe for magnetic monopoles, but apparently so far nobody has ever “seen” one. Micro-Manipulation – He worked with particles so exceedingly small (10-4 to 10-5 cm diam., +/- 0.1 to 1 micron) that several had to be lined up by micromanipulation before their end-to-end diameters added up enough to be measured, and it was perhaps because such extremely complex calculations went into measuring the charges on those particles that scientists in Ehrenhaft’s day discounted the final results of his experiments, which he concluded in 1937. The premiere investigator into the effect of magnets to promote dissociation of water was Professor Ehrenhaft. This ties in with Stan Meyers claims of ‘fractioning’ water and Randoll Mills claims of a ‘hydrino’ which is based on a fractional hydrogen charge…kind of a SUB-isotope of hydrogen. New evidence that there is another world of almost infinite minuteness, beyond the electron which only recently replaced the atom as the smallest thing in the universe, was brought forward by Prof. Felix Ehrenhaft of Vienna University at the meeting of the Association of German Natural Scientists and Physicians. Prof. Ehrenhaft’s data were obtained by means of a new and highly powerful apparatus for the ultramicroscopic examination devised by himself, which makes possible the observation of particles far below the limits of ordinary microscopic visibility, floating freely in a gaseous atmosphere in a magnetic field. He observed in this magnetized submicroscopic field the behavior of globular bits of gaseous selenium with diameters of only 1/250,000 of an inch. Their rate of drift, under the influence of the magnet, indicated that the electric charges they carried were less than the equivalent of one electron. This would indicate, according to Prof. Ehrenhaft, that the electron is subdivisible, and therefore, that something smaller than the electron exists. – Or using HYDROXY Gas to heat a tungsten element to around 2,900 oC (if it can stay stable), with very hot water vapor coming from a Vortex Room that will break in contact with this very hot tungsten element. Need electricity to start to produce Hydroxy and water vapor, but immediatly after the vapor start to break, we can use a part of the produced gas (if it is also Hyroxy Gas)to heat the tungsten element and produce the vapor, under an over-unity process; as we now that Hydroxy gas can give 3 to 4 times more energy that it needs to be produced. # A suggestion : The engine’s vacuum pumps vapor from an heated water tank (may be with air inlet inside for nitrous compounds creation), takes on the way the electrolytic Hydroxy and go inside a small copper pipe, in opposite sens (for magnetic field production) to a vortex room (for acceleration and heating) and then in an electrically heated modified GEET (plasma field created inside, with add of a catalyst for more dissociation action; nickel, …), to finish ignited by a super plasma spark (may be not necessary). Standing in the starting blocks, we are just waiting for opportunity to put all this ideas in practice/testing. Small budget, short term results, and world record warranty ! please join this successful story. 1805-2005:200 years of turning water into fuel! It has been over 200 years since humans first turned water into hydrogen and oxygen, using electric current. In 1805 came the first car with an internal combustion engine that ran on water! What happened next? The purpose of the Water Fuel Museum is to tell the interesting tale of water fuel technology development. In 1875 Jules Verne wrote in “Mysterious Island” that ‘water is the coal of the future’. He was no prophet; it was already happening! Patent after patent has been filed in the U.S. and abroad attesting to the reality of this awesome and non-polluting fuel source! It could even reverse global warming by producing oxygen in excess of what is needed for combustion! Shouldn’t people know about this? We think so. That’s why we’re opening the world’s first museum dedicated to telling the story. Come see us on opening day: October 1, 2005 at 1012 Manchester Street, behind Rupp Arena. Hours:10:00 to 6:00 Monday thru Saturday. Adults $4.50 Seniors (60+) and children $3.50 Y’all come! # Steven Horvath (1978) Use of radiolysis to a hydrogen cell. note: water from air is a main goal to free energy supply, because harvesting the humidity of air to provide drinking water to everybody is possible AND very important. 3 days without drinking and u die.